So I just received in the mail, the now Out of Print, Subterranean Press’ 2011 HC edition of GRIMSCRIBE. 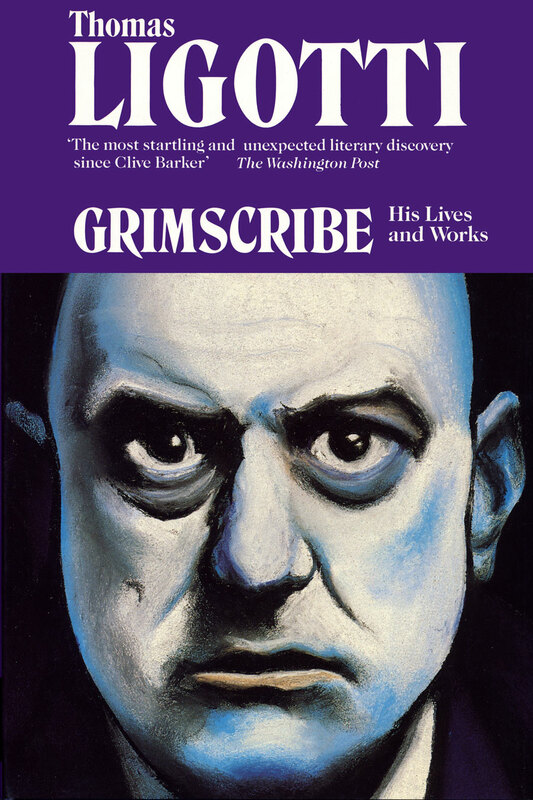 Now I own the original 1991 Carroll & Graf edition, but my interest was piqued by the sold out nature of previous Subterranean Press editions, the wonderful cover art as well as the description of their Grimscribe edition as being revised and definitive. Dust jacket by Aeron Alfrey. So biting the bullet I picked up one of the sold out Subterranean editions (sold out in less than 3 months, which is pretty darn impressive), thankfully for not too much more than cover price (it’s now, in the brief 2 weeks since I purchased it, climbed to the 3 figure range) and having perused it today I have to say, my initial impression upon taking it out of the box is… I’m a bit dissapointed. I mean I really am disposed to like imprints such as Centipede Press and Subterranean Press, that in this day of digital are trying to make the hardcopy something attractive and special. My problem is for the price, I’m not even talking the marked up reseller’s price, I’m talking Subterranean’s retail price, GRIMSCRIBE when finally seen is underwhelming. I mean for the money I don’t think a slipcover done to quality, embossing on the cover, and maybe spot illustrations and a ribbon marker and gilded pages are too much to ask. 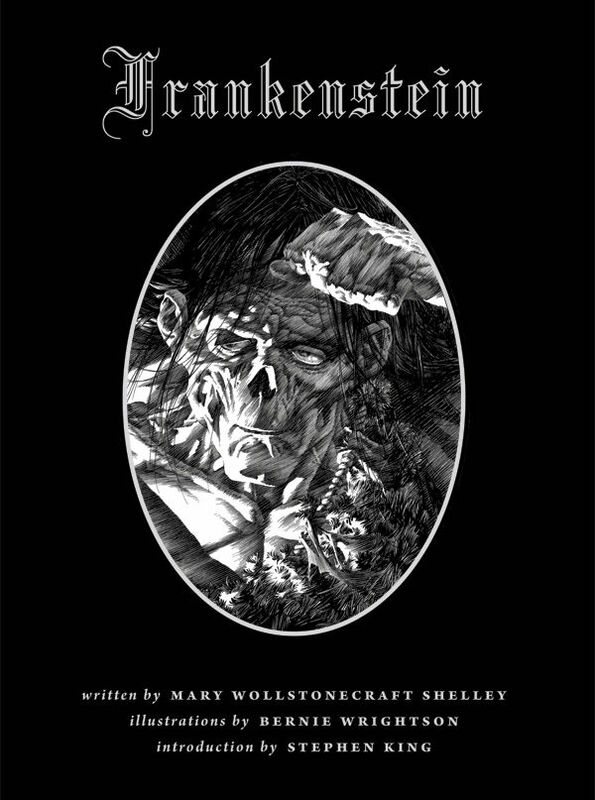 Look at books such as Dark Horse’s FRANKENSTEIN illustrated by Bernie Wrightson, which sells for a fraction of the price of Subterranean’s books, but in terms of quality there is no comparison. Dark Horse’s FRANKENSTEIN is a work of art. Something you’re going to be treasuring and proud to have on your shelf for a long time. I can’t say that for Subterranean’s GRIMSCRIBE. The first thing that strikes me is it’s a smaller, less imposing/less impressive book than what I was expecting. Just average HC trade dimensions. 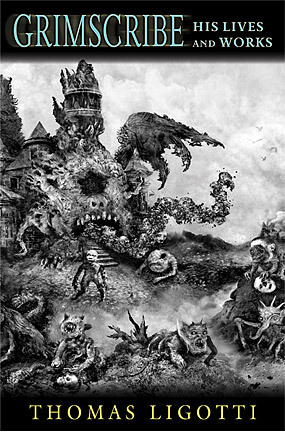 And the slipcover which boasts imaginative art by Aeron Alfrey, unfortunately undermines that art quite a bit with a muted, even muddy looking printing, and cropping/shrinking the image rather than allowing it to take up a respectable amount of the cover. But getting beyond the slipcover the book itself is just an average brown coated HC, with blue type on the binding. The interior however does offer large, legible, and attractive type. Now onto the heart of the matter, the “revised, definitive” nature of this new version. Is it or isn’t it, an improvement over the original? “One thing I did not do is deliberately seek out changes. Of course there would be errors that needed corrections and phrases that needed to be polished. But I didn’t look to shorten or lengthen the stories or any part of them, or to make my prose leaner or more baroque, or to in any way alter the tone of a given story. I just read the books carefully from start to finish and keep on the lookout for additions and deletions that would enhance each story, at least to my mind.”—- see full article here. Okay, a writer can change his work if he wants, I mean it’s his work. But sometimes you can’t go home, and sometimes a writer or a boxer or an actor’s best work is behind him rather than in front. Frank Miller’s great comics are all decades in the past, his current work a poor shadow of him in his prime. Bernie Wrightson is one of the most hailed and influential artists of the 70s and 80s, but his work in the 21st century (while still head and shoulders above most artists) for a variety of reasons, cannot compare to the artist he was. I’m saying the changes a 21st century Thomas Ligotti makes are perhaps not an improvement on the writing of a 20th century Thomas Ligotti. Again the changes aren’t many and aren’t drastic, I just don’t think they improve on the original and for the most part I find them to be the clunky exposition of age, rather than the fertile and frenetic choices of a visionary. I find his earlier word choices, in almost every case, to be the stronger, more poetic, more memorable. The mating of differences, terms like “awful purity” and “invisible moments” wonderful baroque phrasing of the original, that are missed in this revised edition. “Without an author whoever lived in this world, if you will recall what I told you about it.” that is a clunky, and unwieldy sentence in the revised version. Again, not a major change, a few words, but they tend to be poorly chosen, and a bit boring and pedestrian compared to the original. And such ‘improvements’ run throughout the stories in the 2011 Subterranean collection. The only thing the Subterranean version has going for it is the slightly flawed slipcover, which flaws and all is a 100 times better than the pathetic slipcover on the original 1991 HC. Unfortunately a slipcover is not enough. So my recommendation, save yourself the dough on Subterranean’s “revised, definitive” edition and get the original HC instead and have your own nice slipcover made for it(all of which can be done for less than the price the Subterranean books are going for).